Thinking of taking your home off the grid or making the switch to partial or complete renewable energy dependence? The smartest thing you can do is to contact Experienced Solar for a turnkey solar system installation in Albuquerque, NM. We design and build systems that are meant to provide homeowners with the best possible ROI and long-term sustainable operation. When it comes to the design and installation of residential solar energy systems in Albuquerque, NM, we’re the foremost experts. Not only do we have decades of hands-on experience developing turnkey solutions for remote powered homes, we’re also on top of the latest products, technologies and resources. We know how to leverage state-of-the-art products into a solar system that will benefit your home for decades to come. Cut your electric bill to ZERO! for a 30% Federal Tax Credit! An electric bill that averages $0.00 a year. You might even get money back! 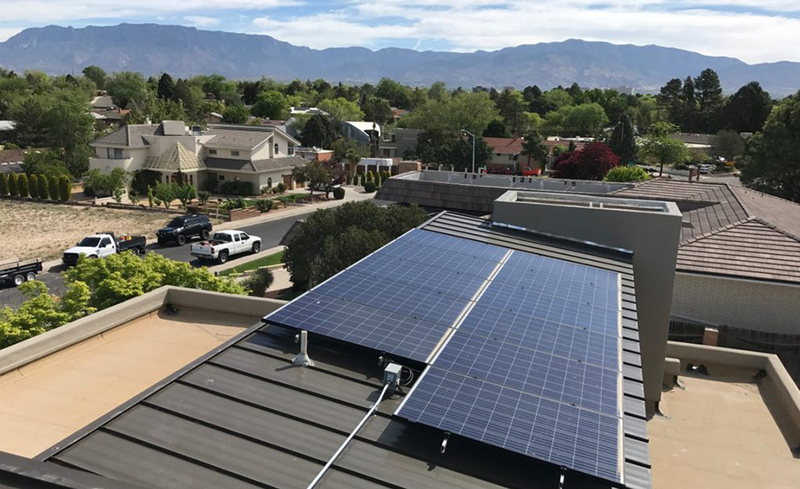 For many homeowners, making the switch to a residential solar system in Albuquerque, NM is one rooted in financial independence. However, there are also exceptional environmental benefits to consider as well. Not only will you reap the capabilities that come from photovoltaic (PV) panels, you’ll create energy without having to rely on fossil fuels. This means running your home on clean energy and, in some situations, selling clean energy back to the grid to help cut down emissions. At Experienced Solar, we know how to get you all these benefits from your solar system, and more. From the beginning, our experience means you get greater expertise and more power out of our system than any other. That’s because, unlike the cookie-cutter companies, we design and build a custom system that’s right for you. Don’t settle for a system that’s built to put a panel on every square foot of your roof, whether you need it or not. Instead, get an Experienced Solar system that maximizes the position of your panels and provides you with lasting value and years of no or low maintenance. Call us today at (505) 600-2771 to request a free quote, we’ll visit you in your home, analyze your electric bills, and customize a system that’s exactly right for you. If you’re tired of being beholden to fluctuating energy costs or a utility bill that comes with added charges, it’s time to consider making the switch to clean, efficient solar energy. Experienced Solar will help you visualize, design and establish a solar power system that delivers energy independence to your home, helping you reap the numerous benefits of renewable solar. Contact us today for a consultation on solar systems and off-grid energy solutions.